Norma Sanchez came to the United States with the dream of a better life. Through strength and perseverance she accomplished her dream. Originally from Mexico, Norma married in 2001 and in 2002 started her journey of U.S. Citizenship. She proudly obtained her citizenship in 2013 with her family at her side. She is now the president of her neighborhood association, volunteers at the Friendship House and is involved with Peoria Community affairs. Norma has a Bachelors in Business from Mexico but knew she needed help with the English language. Norma started English as a Second Language classes at Illinois Central College Adult Education program in the fall of 2014 and quickly accelerated through the material and started taking GED classes concurrently with ESL. Norma is an outstanding student who shows leadership in the classroom. After hard work and dedication she felt proficient enough to start taking sections of the GED Test. She continued to work toward her goals. 2015 proved to be a big year for Norma, achieving several awards. 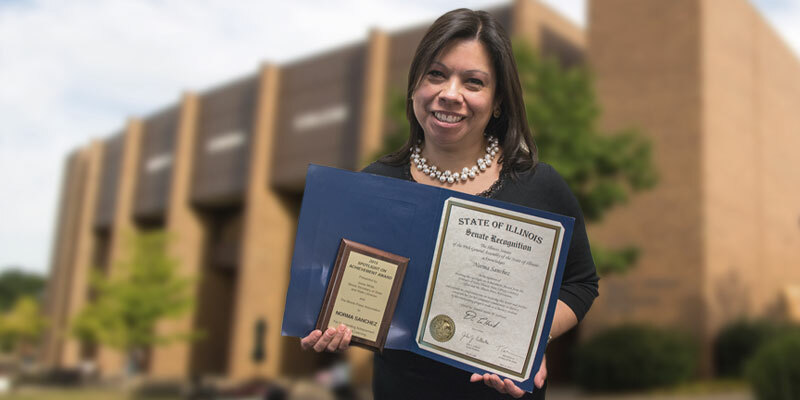 2015 Spotlight on Achievement Award- Sponsored by the Secretary of State/Illinois State Library Literacy Office and the Illinois Press Association for being an outstanding adult literacy learner. 2015 Adult Literacy/UPWARD Program Achievement- Top 10 students in the state. Norma has received congratulatory letters from the Secretary of State Jesse White, Congress woman Cheri Bustos and Senator Darin LaHood. Norma went on to receive her GED in February of 2016. She has accepted a position in Darin LaHood’s office serving the Latino Community. She plans to pursue a degree in Political Science and continue in government service. Norma is just one of the many students who have found success through the Adult Education program at Illinois Central College. To start your path to success, contact Adult Education services at (309)694-5240.